The Basement Revue is a cross-pollinating half-music and half-literary variety show with a rock-’n’-roll sensibility and a unique Canadian voice that has blossomed into one of Canada’s most interesting live event series. 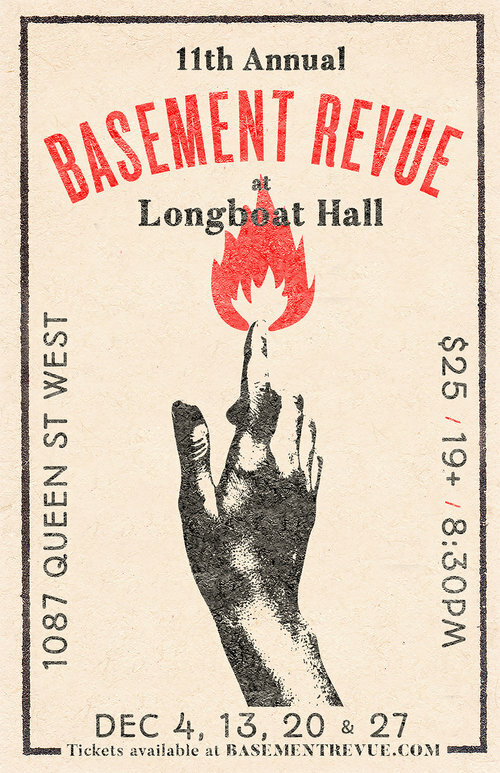 The Basement Revue is the creation of well-known Canadian musician, songwriter and producer Jason Collett with poet and editor Damian Rogers joining as co-host and literary curator in 2009. More than a great night out, The Basement Revue is both a showcase and an incubator for Canadian culture. Its unique multi-platform model is designed to introduce emerging artists to a deeply engaged audience and to provide a supportive environment for established artists to experiment, take risks, and develop new work. As artists themselves, Collett and Rogers aim to serve their community by facilitating collaborations across disciplines and by fostering creative relationships among an expanding circle of musicians, poets and storytellers. They are committed to holding space for Indigenous voices and consider it a guiding principle to prioritize conversations and connections among Indigenous and non-Indigenous artists. This concert series has grown significantly in the last four years. Of particular poignancy was The Basement Revue’s December 2014 Opera House show, honouring a theme of reconciliation for the first time. The country still raw from the stories of Tina Fontaine and Rinelle Harper, the issue of murdered and missing Indigenous women in Canada resonated in a profound way with the artists who were brought together. Co-curated with Joseph Boyden and A Tribe Called Red, the event, dedicated to Missing and Murdered Indigenous Women, featured collaborations between Boyden, A Tribe Called Red, and Lido Pimienta; Shary Boyle and Emily Vey Duke; Leanne Simpson and Tara Williamson; Gord Downie, Kevin Drew and Dave Hamelin; Naomi Klein and Cris Derkson; Lee Maracle, Columpa Bob, and Jennifer Castle. These performances are now featured on the National Association of Friendship Centre’s online home — NewJourneys.ca. The Basement Revue has presented original collaborative performances by some of our country’s most celebrated musicians and writers. The Basement Revue has also shown a consistent commitment to introducing audiences to artists they have never heard before. Over the years, Collett and Rogers have curated an impressive range of established and emerging artists, which also include Broken Social Scene, Daniel Lanois, Rufus Wainwright, Bahamas, Hydra, Snowblink, Andy Kim, Torquil Campbell (Stars), Jimmy Shaw (Metric), Buck 65, K-OS, Tanika Charles, John K. Samson, Hayden, Vag Halen, Whitehorse, Arkells, Sarah Harmer, Bry Webb, Tabatha Southey, Linda Spalding, Karen Solie, Alvvays, Misha Glouberman, Leon Rooke, Kathryn Borel, David McGimpsey, Tanya Tagaq, Hannah Georgas, Reuben Bullock, Charlotte Day Wilson, TUNS, Amelia Curran, Charlotte Cornfield, Bernice, Drew Hayden Taylor, Anne Waldman, Sheila Heti, Pasha Malla, Aisha Sasha John, Jean-Marc Ah Sen, Tracey Lindberg, Ken Babstock, Dennis Lee, Lynn Crosbie, and Hal Wilner. Hosted every Thursday in December at The Dakota on December 1, 8, 15 and 29, The Basement Revue will return again to The Great Hall on December 22 for an extra special edition. Tickets are $30 for each night and can be purchased online only by visiting BASEMENTREVUE.COM. Doors open at 8:30pm. In the meantime, The Basement Revue Podcast is now live and available for download. Subscribe now, and listen to the first three episodes right away. Recorded during the 2015 season at the Dakota Tavern in Toronto, the podcast now gives listeners that were unable to attend a front row seat to these intimate performances. “By paying joyous musical homage to the '70s greats while also singing about what we ought to reclaim from that bygone era, Jason Collett has given Song and Dance Man a quality that's both timely and timeless” Exclaim! Following a landmark ninth annual Basement Revue residency at Toronto’s Dakota Tavern throughout December, Jason Collett is ready to take his new album Song And Dance Man on the road. Gathering up the members of Canada’s premiere modern classic rock group Zeus as his backup band, Jason Collett will play a very special hometown show on March 9 at The Mod Club before hitting the highway with opener Kalle Mattson starting April 19 in Regina and making stops along the way in Vancouver, Victoria, Calgary, Edmonton, Saskatoon, Winnipeg, Kingston, Wakefield, Waterloo and more. All tour dates can be found HERE and are also listed below. To celebrate the upcoming tour and today’s release date of his long awaited sixth album, the Toronto songwriter has shared the video for “Love You Babe” courtesy of Paste Magazine. Edited by Arts & Crafts label mate Hayden Desser, the golden era animated clip takes a (mostly) light hearted look at romance while capturing the true topography of love. Produced by Bahamas’ Afie Jurvanen, Song And Dance Man’s thirteen songs bear the wit and melody of classic Jason Collett: contemplative reflections on getting older, backed with an affinity for freewheeling disco music. The album’s conspiring themes of love & loneliness, sun & shadows, are buoyed by its soaring sound. Each song rises into an easy, spacious groove, lead by Jason’s languid melodies and Afie’s sun-drunk bass. The result is a dynamic addition to a strong body of work. Recorded in spring 2015 with long-time collaborators drummer/engineer Don Kerr (at his Rooster Studio), Christine Bougie on guitar & lap steel, Zeus’ Neil Quin on backing vocals, and Afie holding it down on the bass, Song And Dance Man may be Jason Collett’s finest effort yet. The storied songwriter is back in the spotlight, more comfortable than ever in the guise of entertainer.